Executive Producers: Margo Blevin and Gerald Milnes. Produced by Jimmy Triplett and Marilyn Palmer Richards with assistance from many. Melvin Wine was never without a song to sing, a story to tell, or a tune to play, and his familiar “one more time” still rings in our hearts. He was born in 1909 at the mouth of Stouts Hollow in Braxton County, West Virginia. Melvin’s chiseled smile was a very familiar sight around many West Virginia music events for the 40 years leading up to his death in 2003. How appropriate that he was laid to rest on the first day of spring just a stone’s throw from his birthplace. Hundreds of fiddlers have learned about playing tunes and living life from Melvin, and through this project, many more will have opportunities to continue learning from him. The interactive CD-ROM contains many tunes, stories, and photos, plus biographical information from Melvin’s remarkable life. A tune can be slowed down or stopped to allow you to study his playing, his bowing techniques, or simply to catch the melody. The DVD contains four films from periods of Melvin’s life: “Melvin Wine: Old-Time Music Maker;” a film made on his porch at home; a Copen Community Center jam and dance; and Melvin’s last Augusta concert. Melvin Wine won many distinctive awards and honors and traveled widely because of his music to events in Washington, Illinois, New Mexico, New York, and many other places. It wasn’t the places he remembered; it was the people he met. They, and we, will always remember him. Finally in 1991, he was honored as a National Heritage Fellow. The awards weren’t as important to Melvin, as were his many friends. 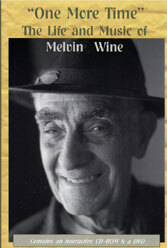 We’re sure he’s still humming “In a Land Where We’ll Never Grow Old.” In memory of Melvin Wine: 1909-2003. Due to Melvin [Wine’s] growing spiritual beliefs, and his unhappiness over the amount of drinking and fighting that took place at square dances, he stopped playing fiddle for more than twenty years. In the late 1950s, Melvin began playing music again. This change in attitude came about when he and Etta found themselves having to look after their ten-day-old granddaughter…The baby started to cry and he couldn’t get her to stop. Eventually, he pulled out his fiddle and started to play for her. Kelly stopped crying at the sound of the music, and Melvin decided that playing the fiddle must be a gift rather than a sin and resumed playing it. Melvin Wine (1909-2003) remains one of the most recorded, documented, and respected fiddler in West Virginia. [He] was awarded the prestigious National Heritage Fellowship by the National Endowment for the Arts Foundation. He made three solo recordings: Cold Frosty Morning, Hannah at the Springhouse, and Vintage Wine. From a small mountain town in West Virginia, elder fiddler Melvin Wine has inspired musicians and music enthusiasts far beyond his homeplace. Music, community, and tradition influence all aspects of life in this rural region. Fiddling Way Out Yonder: The Life and Music of Melvin Wine shows how in Wine’s playing and teaching all three have created a vital and enduring legacy. Wine has been honored nationally for his musical skills and his leadership role in an American musical tradition. A farmer, a coal miner, a father of ten children, and a deeply religious man, he has played music from the hard lessons of his own experience and shaped a musical tradition even while passing it to others. Fiddling Way Out Yonder examines the fiddler, his music, and its context from a variety of perspectives. Many rousing fiddlers came from isolated mountain regions like Melvin’s home stomp. The book makes a point to address the broad historical issues related both to North American fiddling and to Wine’s personal history. Wine has spent almost all of his ninety-two years in rural Braxton County, an area where the fiddle and dance traditions that were strong during his childhood and early adult life continue to be active today. Utilizing models from folklore studies and ethnomusicology, Fiddling Way Out Yonder discusses how community life and educational environment have affected Melvin’s music and his approaches to performance. Such a unique fiddler deserves close stylistic scrutiny. The book reveals Wine’s particular tunings, his ways of holding the instrument, his licks, his bowing techniques and patterns, his tune categories, and his favorite keys. The book includes transcriptions and analyses of ten of Melvin’s tunes, some of which are linked to minstrelsy, ballad singing traditions, and gospel music. Narratives discuss the background of each tune and how it has fit into Melvin’s life. While his music is tied to community and family traditions, Melvin is a unique and complex person. This biography heralds a musician who wants both to communicate the spirit of his mountains and to sway an audience into having an old-fashioned good time. Drew Beisswenger is a music librarian at Southwest Missouri State University. His work has been published in Tennessee Folklore Society Bulletin, the EMIE Bulletin, Mid-American Folklore, and the Arkansas Review: A Journal of Delta Studies.